I first had smashed potatoes at a friend's, who topped them with rosemary and salt and served them alongside grilled steak. Then, on a recent trip to Seattle, I tasted my second variation of smashed potatoes at Lola. Those potatoes tasted of garlic and thyme and a mysterious spice that I couldn't shake out of the waiter. Serve these with grilled or roasted meat, or eggs — scrambled, fried, or baked into a frittata. While the potatoes are cooking (see Note, below), heat a skillet over medium heat. Add the olive oil and garlic cloves and cook, stirring often, until the garlic cloves turn a very light golden brown. Turn off the heat. Remove the garlic cloves from the oil with a slotted spoon and discard (or reserve for another use). Pour the oil into a small pitcher or glass measuring cup. Stir the paprika into the oil. Spread the cooked potatoes out on a large baking sheet. Place a heavy mug over each potato and apply enough pressure to smash the potato. Smash all the potatoes. Stir the garlic-spice oil, then drizzle it over the potatoes. Sprinkle the potatoes with salt and pepper. Roast in the preheated oven for 25 to 30 minutes, until warmed through and crispy on the outside. Serve immediately. Cook the potatoes in the microwave until just done. You can also roast the potatoes by tossing them with olive oil and salt and cooking them in a 400-degree oven until they are cooked through. 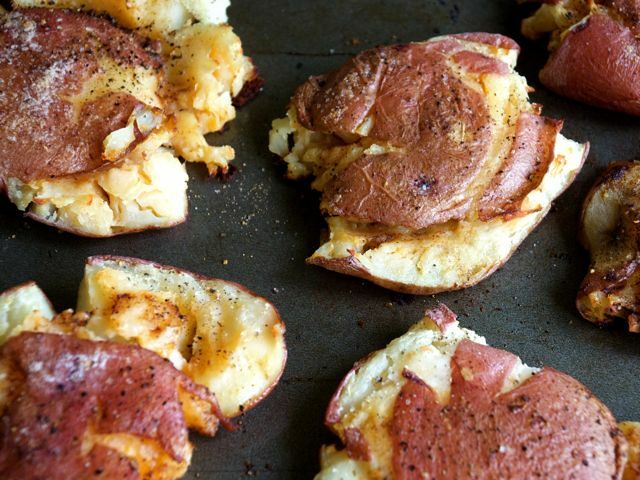 Or use leftover roasted or boiled potatoes.